This article is not going to cover if you should or shouldn’t be using a foam roller to release your ITB as this is a clinical decision that should be made by your Osteopath or other practitioner based on your presentation and a range of factors. This article is designed as a reminder to aid patients whom have been prescribed this exercise as part of their management plan. 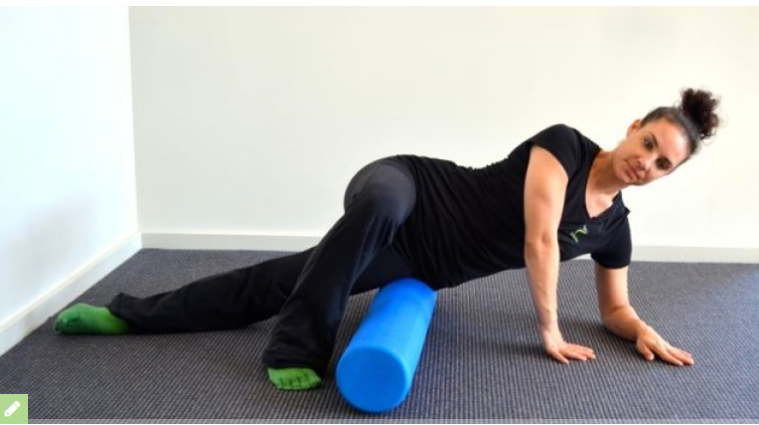 * Cautionary note: When using a foam roller to release your ITB in this manner it can put stresses through the lower torso, specifically the low back and if you have a weakness or an existing injury in this region this may not be suitable for you. To assist with this it can be beneficial to maintain a mild contraction through the lower abdomen to assist in protecting your back. Lay on your side with the roller placed on the under side of your thigh positioned somewhat perpendicular to your body. Using the elbow and forearm of the arm closest to the ground to support your upper body and the outside part of the leg closest to the ground to support your lower body. Trying to keep your body as neutral as possible – that is in a straight line. Use your limbs closest to the ceiling to moderate the pressure with which the roller pushes into your thigh. The “rolling” component of this activity refers more to gaining position than actually rolling. From our experience you get the best release in the tissues by pausing at tender points and allowing the tissue to soften rather than rolling over it repetitively. You may need to pause on a tender spot and wait for the tissue in your thigh to release. This can take longer than a minute sometimes. When performing this exercise it is common to experience a level of discomfort however overt pain should always be avoided. Be careful not to over do it, pushing harder can lead to extreme discomfort, therefore leading to increased tension and the whole process becoming counter productive. Perform this exercise for the frequency and duration as advised by your Osteopath or Pilates Instructor. Authors thoughts on using foam rollers in general and for ITB release. We use foam rollers and other devices for self massage (self myofascial release). By applying pressure to tender areas of your body you can achieve decreased tissue tension. This enables muscles to return to their normal length and function. By using a process of self massage your muscles will be healthier, more elastic and ready to perform. As a practitioner the idealist in me thinks that if a patient is performing a well balanced exercise program, then they may not actually need to use a roller at all. This said, most of us (myself included) are often squeezing some type of exercise into an already busy lifestyle. I feel the foam roller is a great tool to assist people in performing some self body maintenance exercises. The popularity of foam rollers is a result of their effectiveness to help so many people both resolve pain and keep doing the types of exercise they enjoy. Why do many of us need to release our ITB’s in the first place? Foam rolling for your tight Iliotibial Bands (ITB’s) may provide somewhat symptomatic relief for a number of conditions. Clinically I often see one iliotibial band much tighter than the other, and this is commonly accompanied by a muscular imbalance in the glutes, quadriceps, or even chronic ankle instability. Furthermore, using a roller should be accompanied by joint assessment and treatment including soft tissue therapy, joint manipulation and possibly some corrective exercises. Tight ITB’s may also be a reflection of poor technique in a regularly performed exercise for example a squat or a lunge, or simply overtraining and not programming adequate rest periods. Whilst tightness in this region seems to be something I see in people from all walks of life it definitely is something that I see a lot of in the very active, aspiring athletes and professional athletes. I don’t necessarily believe these people have any worse biomechanical faults compared with asymptomatic people more so that they push themselves to a level where their biomechanical faults and muscular imbalances are more overt. * Foam Rollers are available at our clinic ask at reception.